MASK Comes-Off: USD Ready To BURN! 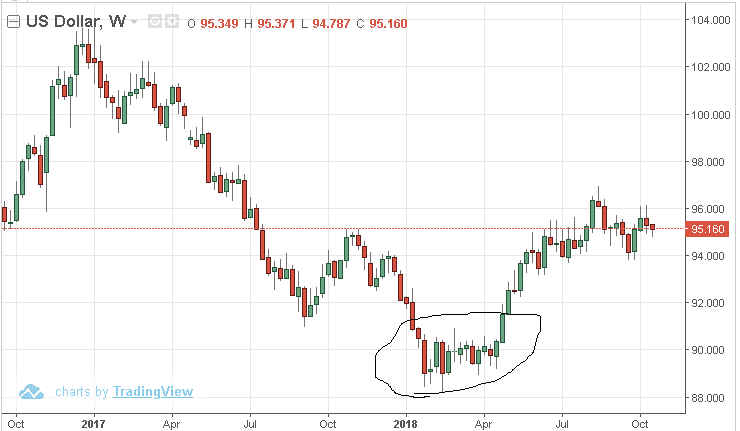 Currently, the USD index, otherwise known as the DXY, sits at 95.51. Earlier this year, when the index was pushing 90.00, before the Dollar surged, we wrote that the world’s most prolific fiat currency was at a standstill. If it were to break out, we wrote, the high target would be 96-105, and if it were to crash, the lower target would be 77-84. As you can see, for three months, the 1st quarter of 2018, the USD was trading in a tight range, which always ends with a huge move, either up or down. The Dollar’s current strength can last for a while, but the latest, incredible jobs report, coupled with Trump’s interview, in which he said that “The FED is his worst enemy” for raising rates too fast, confirm that the economy is finally, 100% on track, even to the point that it scares central bankers – inflation concerns. The jobs market is about to become even tighter because wages are rising, so people are going to spend more, resulting in the demand for more skilled labor, further accelerating hiring – it’s a self-reinforcing cycle. Since 2011, the mighty buck has been the clear winner of private-sector deleveraging and of low inflation, while commodities have been the sore losers. Now, the mask comes-off, though, and the USD will enter its next cyclical decline, which will take it down by some 25%-30%, with a lower limit of 67-70 on the index. Shorting the USD is one option, but going LONG, the clear winners of the dollar’s weakness, is my forte. This is a multi-year move, so no need to jump the gun and go heavy all at once. Instead, like the Puma, let’s watch our prey and wait for the right moment. As we do every 60-day period, let’s go over new portfolio holdings, as well as update on current positions. Before getting into the nitty-gritty, I want to stress that we are in the final leg of the long and beautiful bull market for U.S. equities. In a bear market or a sideways market, price appreciation or the expansion of multiples, such as P/E ratios, plays a miniscule role in generating returns. Dividends are far more important, as well as finding specific opportunities, instead of just blindly following the index. The S&P 500 will not be a major source of wealth in the coming decade. Stock pickers will do well, as well as commodity bulls, but pension funds, which rely on passive indexing, as well as 401K programs, will underperform. Making good returns in a bull market is easy, but advancing, while others are staying put in the bear market, is greatness. Most investor’s toolkits don’t include specialization in the junior mining sector, nor in cannabis or blockchain technology. 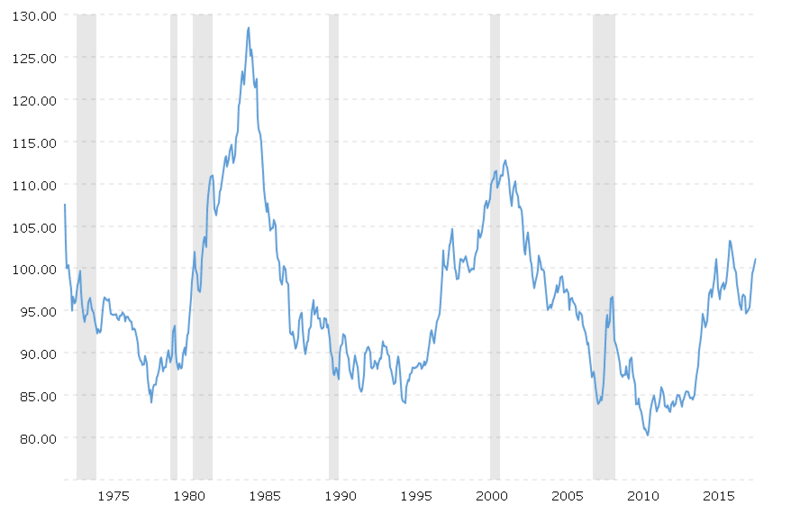 When I began investing at age 16, in June of 2000, three months after the Dot.Com bubble burst, the market commenced on an eight-year sideways market, which ended with the collapse of 2008. This is the time in which I built the majority of my early investment fortune, so sharing with you my strategies for the next bear market is one of the most important goals of the newsletter. Between the end of August and today, Walgreens (WBA), one of my biggest positions, which we profiled at $63, has had a superb 60-day period. It’s up 21% in a few short months, and above our maximum buy-up price of $66. Be patient, if you are looking to become a shareholder. AT&T (T) continues to be the safest holding, which is still under our maximum buy-up price of $34. Its dividend is safe and is one of the highest there is, 6.17%, for a company that is expected to grow at a 6% pace. With an intrinsic value of around $38-$41, we’re looking at annual returns of around 16.7%, compared with a projected 5.1% for the S&P 500. I’ll be adding to my position. For the last innings of the bull market, here are the two stocks that I’ve been buying on dips, which, as we see it, will be huge winners in the years ahead. 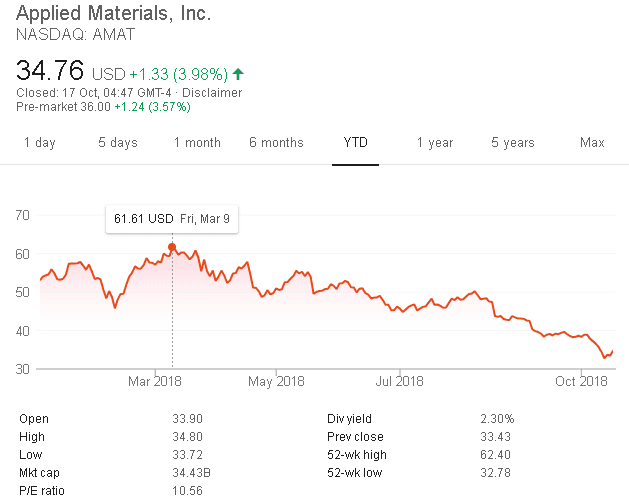 Applied Materials (AMAT): One thing that attracted me to AMAT is that it’s down nearly 50% in six months. I love buying cheap, which is what the market is offering us with this stock. This is a company I intend to hold for 5-10 years, going forward, and I see it as one of the ultimate bear market businesses to own in the portfolio. The main reason is that it is increasing the dividend at a wildly juicy speed, as well as expanding its operations and becoming indispensable to its customers. The P/E ratio is only 10, which is the reason I took a position, following last week’s major drop at $33.57. Below $36, this is the biggest bargain in the large-cap markets today for value investors, in our view. 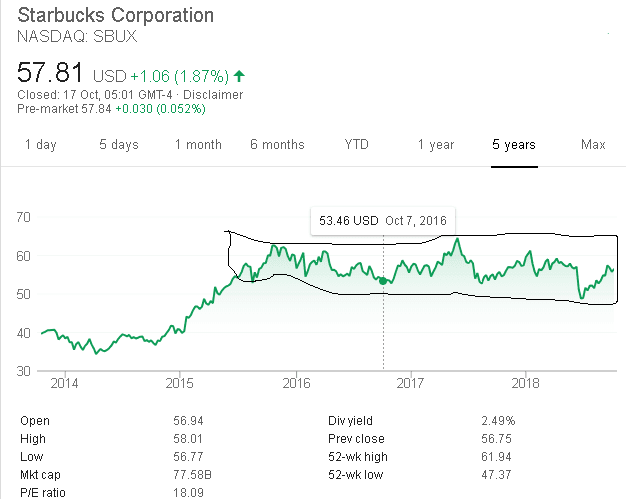 Starbucks (SBUX): I rarely invest in the restaurant business. In fact, this is the only major position I’ve taken in a retail foods business in 12 years. But, the sophistication here is that this is actually a play on Asian middle-class size explosion. Starbucks has more than 350,000 employees working at more than 28,700 locations in 77 countries. Since going public in 1992, investors have enjoyed 19,523% gains, 200-times its original value. This summer I visited Seattle, the birthplace of Starbucks, even visiting the original branch. In the next 20 years, Starbucks will become a dominant force in Asia, servicing billions, who will drink their coffee. It’s a simple business, with a management philosophy that innovates and puts the customer first. The potential is enormous, but investors are scared because the legendary CEO has left. This reminds me of the unfortunate death of Steve Jobs, which did not stop Apple’s insane growth story, despite his brilliance. Just like with the USD trading range, which ended in a breakout, we foresee SBUX shares taking-off, as fears subside. This is the reason I took a position at $56.69 and will continue to purchase under $59.43. I’ll be in Hong Kong at the beginning of November, as I’m putting much emphasis on Asia, going forward, and Starbucks is such a clear example of a direct way to make a fortune from the Asian Century. Global expansion is my top-ranked investment theme. Frontier markets are critical for growth, since the U.S. is saturated! This Sunday, Wealth Research Group will make one of the newsletter’s most historic announcements. Our letter will go out at 09:00 AM CST. HUGE News: Profit Now Before it’s Too Late!